Allow us to introduce ourselves. We've both spent our careers in varying levels of professional advisory capacity with the planning commissions of smaller communities. Before moving to the Kansas City area this past year, Jim worked for many years in Ball State University’s Community Based Planning Projects program, providing assistance to more than one hundred communities and many plan commissions (as planning commissions are called in Indiana). He also served on the Plan Commission in Delaware County, Indiana. Lisa spent over a decade as a circuit-riding planner for a regional planning organization serving the western fringe of Metropolitan Atlanta. Together we will be picking up “The Planning Commission at Work” column, ably written for the Planning Commissioners Journal for many years by our friend Michael Chandler. It is our hope that as a team, we can continue in Mike’s fine tradition of taking the mystery out of comprehensive plans and other topics by providing you with plain, down-to-earth information that you can use. What does your Comprehensive Plan say about the proposed development?” We both wish we had a nickel for every time at planning commissioner training workshops we’ve asked participants that question. 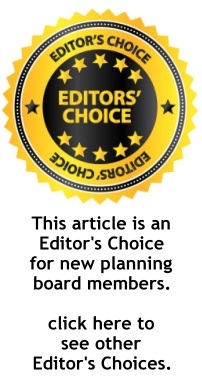 When you agreed to take on the job of planning commissioner, you most likely received a copy of the comprehensive plan, sometimes called the master plan, municipal plan, or overall plan. 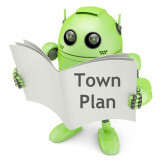 That plan is what might be considered your community’s Little Instruction Book, chock full of basic information about your community -- past and future -- including the community’s goals, and the purpose behind your regulations and programs. In a nutshell, the comprehensive plan lays out how the community sees itself in the future and how it intends to get there. The zoning ordinance, which is the other book (along with the zoning map) you probably were handed on your first night, is the set of rules used by the community to implement the plan. The comprehensive plan and the zoning ordinance are not the same thing, but they should relate closely to each other. Much of what you’ll be asked to do as a member of the planning commission, including every zoning change request or new development project you’re asked to consider, must be evaluated on how well it fits within the community’s goals established in the comprehensive plan and the ordinances. To be effective, your plan and ordinances should be consistent with each other.